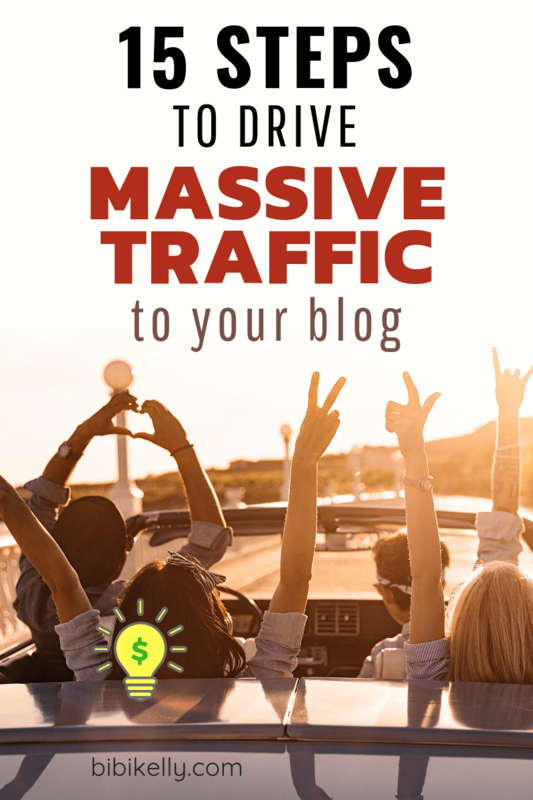 If you only mastered one skill, knowing how to drive massive amounts of traffic to your blog would be the skill you’d want. 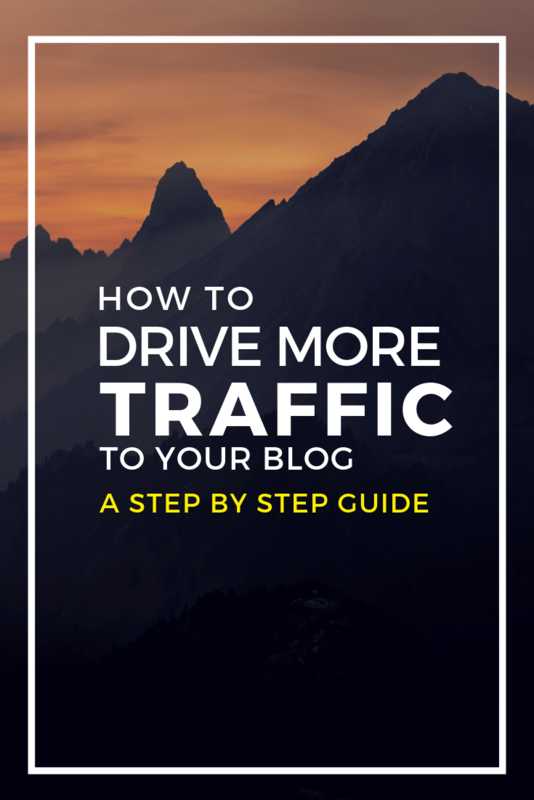 Website traffic is the key to your blogging success. The master of one is better than the master of none. Sometimes I repeat myself over and over again in blog posts, and I apologize for that, but certain vital points have to be repeated and emphasized because if they go ignored, your blog is doomed to failure. Remove the word multi-tasking from your vocabulary. Before we followed this fundamental principle, we struggled online. If you spread your attention and energy around trying to complete too many tasks, you will fail. Everybody wants traffic to their blog. Writing a blog with no readers is not fun, nor does it make you any money. There are 4 strategies listed in the Start Right Away section. All are excellent methods to drive traffic to your blog. We want you only to pick one to start with. Pinterest is our primary recommendation. If the Pinterest strategy works for you, don’t implement the other strategies(yet). Apply laser focus to Pinterest, make more pins, make better pins, keep doing what works. Better yet, double your efforts, pin even more, etc. Apply laser focus to one traffic method at a time. Just to clarify, you don't have to pick Pinterest as your first strategy to try. You can choose any of the 4 strategies listed in the Start Right Away section. One last word of caution I want to drive home. This is another piece of advice I wish I had learned earlier in my blogging and internet marketing career. Even seven years into my online internet marketing career, I still fall victim to internet noise. Writing this very blog helps me to stay focused and not let internet noise derail and delay progress. Internet noise happens when you watch too many YouTube videos or read to many blog posts in your spare time. One expert says this strategy is working awesome right now, or that you need to buy this course to succeed or you need to read this book to succeed. On and on it goes. To best way to avoid this pitfall is to follow fewer gurus. Find a mentor, follow their advice and stay the course. 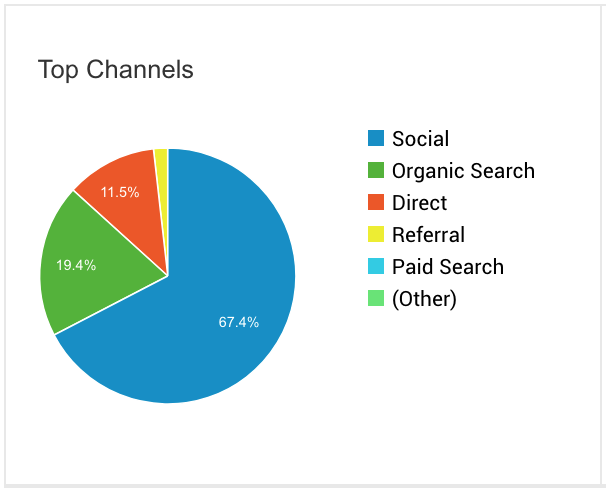 I've included a few snapshots from Google Analytics of our e-commerce shop, JooJoobs.com. The snapshots are over a one year period from July 2017 to June 2018. Our primary traffic strategy for JooJoobs is Pinterest. Two-thirds of all our traffic comes from Social, and 98% of that two-thirds is Pinterest. Customers discover our shop using this method. Pinterest allows us to build brand awareness, generate sales and to capture leads (email marketing). Teaching 'How to Pinterest' is a course or book in itself, and that's a little beyond the scope of this article. Here is the quick and dirty summary of each of these steps. Your Pinterest Profile - you need to have an organized and themed profile. Nobody likes clutter. Create boards for each of the major subjects that you cover on your blog. Consider having board covers that all look the same. For sample board covers, look at our Pinterest profile. Creating Pins - This is by far the most crucial step. There are lots of websites that can assist with the creation of pins: Canva, Picmonkey, and Stencil. If you don't have the skills, hire someone off Upwork, Fiverr or 99 Designs. Using Tailwind, you can find other people's viral pins really quick. Save these viral pins and use them as templates for creating your own future pins. Don't reinvent the wheel. Make content similar to content that has already gone viral. Automation - You need to automate some of your Pinterest work. Tailwind is the industry standard these days for Pinterest scheduling and analytics. You have to schedule your pins, so they are pinned during the prime time hours so more people see them. Use Tailwind analytics to find out what works and what doesn't. Networking - After creating awesome pins, the 2nd most important skill is networking. It's a social network, you need to make friends, preferable friends that also take Pinterest marketing very seriously and who have access to big audiences. This will take time. Make sure your profile is professional, and you have great looking pins before investing a lot of your time into this step. This is step #4, perfect 1, 2 and 3 first. You will have to go off Pinterest and find people in your niche, contact them via their website, try to partner with them, create your own private group boards. Networking takes time, but if done right, it will pay off in the long run. In addition to Pinterest group boards, Tailwind has also created Tailwind Tribes. It's very similar to group boards just with a different interface. I like it but its the exact same as group boards, it requires networking. Paid Ads - We talk about Pinterest paid advertising more down below in #12. After Pinterest, guest posting on more prominent blogs should be the strategy you use to drive traffic to your blog. This is a strategy that can be used by newer blogs, not just for the more established blogs. Still, your blog should be looking complete will a crystal clear focus. When visitors come to your blog, they should be impressed. If this isn’t the case, fix it first. There are no shortcuts to becoming a successful blogger. A complete 8-page blog is better than 100-page hodgepodge. Backlinks from Higher Authority Blog in your Niche. Make sure the post is an epic masterpiece, you want it to be a popular post, not just another article that gets buried on their website. What is an ego article? Most blog posts you write, you are the expert solving a problem, or presenting your best solution for a problem. The 20 Best Pinterest bloggers or The Top 10 bloggers Who Really Know Their SEO. This type of post is also called an Expert Roundup article. Networking, this gives you an opportunity to contact the featured subjects of your post and let them know about it. Social share opportunities from bloggers with larger audiences. Exposure to a bigger audience, similar to guest posting, but you approached it from an indirect route. This is a passive strategy. One that will gain you traffic over time, not right away. New websites will experience the Google sandbox. Essentially, Google ignores your website for 'X' amount of time. You can't do anything about this, just wait it out. Google prefers established brands, websites it trusts. On page SEO is vital, must be implemented in all posts and pages on your blog. Visually appealing, use lots of pictures, infographics, and charts. i.e., making backlinks, don’t bother. It’s not needed anymore. User experience is much more critical these days. If an article is on page 1 of the SERPS, and more and more people are clicking this article over others on the page, Google will move this article higher up in the SERPS. There are hundreds, if not thousands of Facebook groups for every niche out there. You can join these groups, comment and contribute and once you are known and trusted, you can start sharing your content. Don't share your content once and forget it. You want to keep sharing your content over and over and over again. This is really easy to do for Pinterest, just make a new pin and point it to the same URL. The content on your blog is valuable. You spent a lot of time writing and researching a topic so make the most of it. Turn your blog content into a podcast, a screencast YouTube video, a slideshow presentation or an eBook. These little tricks can easily double your traffic from alternative mediums. Also, it's an excellent way to get discovered by an audience that might never have ever found you. Some people never read blog posts, but love watching YouTube videos. eBooks can be used as free giveaways for your mailing list, or you can create a course. Whatever you decide to make, make sure to keep repurposing your content for maximum value. There is a lot to learn but for new blog owners, for starters, just get your email list going right away, don't delay. The easiest starter technique is the free eBook giveaway. Write a short 8-page guide on a specific subject, like Pinterest Marketing for Beginners and offer it as a free giveaway. Once readers have subscribed to your list, send them value. Don't just send them stuff to buy. Send value and develop a relationship with your audience. Email lists are also vital to create re-targeting Facebook/Pinterest campaigns. 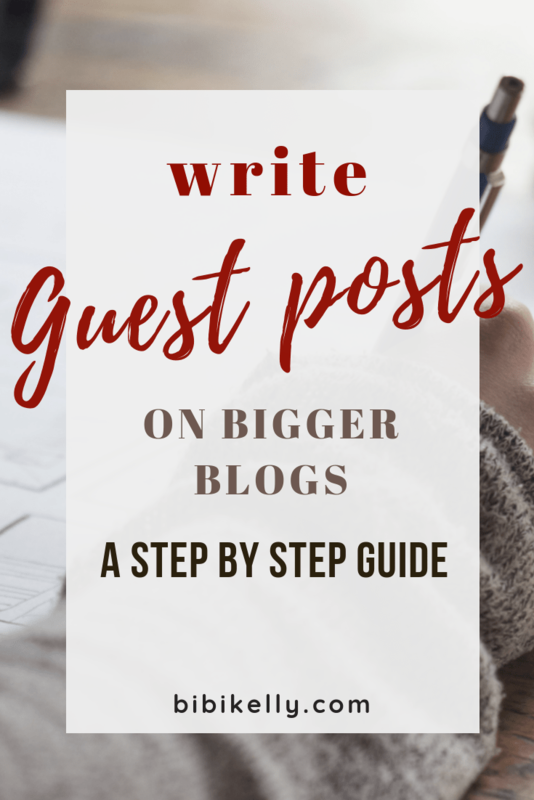 Down the road one or two years, once your brand is a little bit known in your niche, you might be able to contact some of the people that you guest posted for in the past and see if they want to 'guest post' on your blog. This technique will probably cost you a few bucks, (you'll have to pay them to write the article) but it will add a further endorsement to your brand, but more importantly, when an influencer produces content, they always want to share it. When they share this article with their social media audience, the traffic will be coming to your blog. Back in #1, we discussed making pins for Pinterest. An infographic is really just a big pin. Most of us don't have the artistic skill to make them, but that's what graphic designers are for. Infographics aren't necessarily going to bring you a lot of traffic directly, but they will bring you lots of backlinks, and lots of backlinks will make your website rank higher in the SERPS, bringing you more Google search traffic. Again like #4 SEO, it is a more of a long-term strategy. Once the infographic is ready, offer it to other blogs in your niche, in return for a backlink. Also make sure to Pin it to Pinterest!! Don't forget about your old posts. Many of us have tons of content on our blogs that didn't really bring any traffic, never converted traffic into customers, etc. Give those old posts face-lifts. Figure out why they didn't do well and fix them. Paid traffic is the holy grail of internet marketing but paid traffic is very competitive. Once you get a campaign to work, i.e., it brings you more revenue than it costs, scale it up as fast as possible. Paid traffic never lasts forever, so when a campaign is working, make sure to get the most value from it. For example, Pinterest Ads use to be super profitable for our e-commerce shop. But Pinterest went and ruined the party in July 2018. We're now having to test and tweak, trying to make this paid traffic source work again. If your going to use Facebook, make sure to learn how to use re-targeting ads. Don't ever use the Boost Post option! Don't be afraid of paid. The last three traffic strategies can easily be performed by a virtual assistant. Create SOPs (standard operating procedures). SOPs essentially detail precisely how you want a specific task to be completed. When hiring VAs, try to hire agencies, they manage and train their employees better than newer independents. Make a list of all the blogs in your niche, visit them regularly and leave comments. It's as simple as that. Commenting is appreciated by the blog owners, and in return, you're bringing more exposure to your brand and leaving a link back to your website. Don't worry that the link is no-follow, it does not matter. People ask questions on Quora and Yahoo Answers. By answering questions related to your niche, you are branding yourself as an expert and again, building your brand. You don't have to leave a link, just make sure to mention your name and your blog's name in the answer. Make sure to leave epic answers. Be an expert so your answer becomes the top voted answer and is read by the most people. For best results, maybe use a VA to find relevant questions to answer, and you be the one to write the final epic answer. Like the previous two, forums are an excellent place to answer people's questions. Make sure to leave epic answers. Forums can also be an excellent place to leave in-depth tutorials. So instead of answering a thread, you're starting one. Some forums still allow you to have a link in your signature, so its another way to build backlinks to your website. So off the top of my head, those are the top 15 techniques I'd use to drive traffic to your blog. There are many, many other ways to do it, these are just the techniques I like to use. To discover how your competitor is driving traffic to their blogs, use a tool like Ahrefs and reverse engineer their traffic sources.